Home Tips	Best Baby Gifts! Happy Tuesday, Friends! I hope you had a great weekend! Today I’d like to share with you my top favorite baby gifts. Babies are tiny miracles from Heaven, so when a new baby is born, I love to give a keepsake that will be treasured and remembered. Come see my favorite, best baby gifts! When I was young, I enjoyed sewing counted cross stitch. I did quite a few pieces and even have a few I started and never finished. Sigh. It’s probably becoming a lost art, don’t you think? So, with my tired eyes and lack of time and patience these days, I’ve resorted to buying finished cross stitch pieces. I love giving away the “Now I lay me down to sleep”, prayer as a baby gift. I think it adds a sweet and spiritual touch to a nursery. I’ve given away all but one, and this one is my favorite. It even includes the last verse, which some leave out. I love the sweet details of the little boy and girl praying with their puppy and kitten. Obviously this piece took someone a LONG time to complete. This piece came framed in a simple and plain black metal frame. Then, quite by accident, I pulled out this vintage gold frame from my stash and the prayer and frame fit perfectly. What a stroke of good luck! I’ll tack the black frame inside of the prettier gold one. I touched up the gold frame with a bit of Rub ‘n Buff in Gold Leaf. Now it’s perfect! I bought this cross stitch piece at an antique store several years ago, but you can also find them on eBay. Some come framed and others not, but as you can see it looks great with a vintage frame. It adds a bit of fanciness to the piece. This one will stay in my Treasure Room until further notice. My other favorite baby gift is vintage rattles. Long ago, a silver rattle was a symbol of wealth and prosperity. Especially if it was a silver rattle with a Mother of pearl teething ring attached. I try to find them in mint condition and clean them gently with baking soda and lemon juice. I have them engraved with the baby’s name or initials. What a sweet and pretty keepsake. These silver rattles also make great gifts. A good friend gave one to my younger son when he was born and I still have it. One day I hope to give it to his baby! These can be found new at most jewelry stores, but also on eBay and at antique stores. I bought this one new on eBay and it is in pristine condition. It can be engraved at any time for a quick and easy baby gift. I also like to give unique stuffed animals as a gift. This one doesn’t sing, but isn’t it darling? 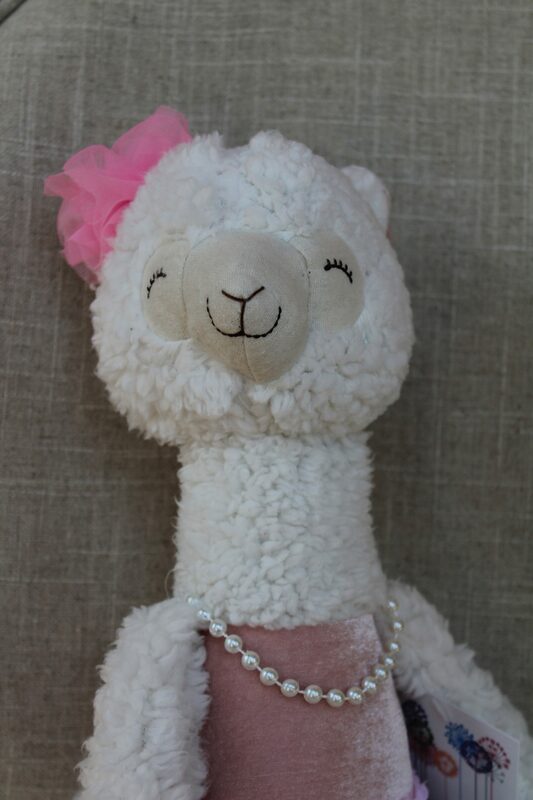 Llamas are all the rage these days and I couldn’t resist this sweet one with pearls and a tutu. I thought it would make a cute baby gift for a special new born baby girl. I dare say, this llama is probably bigger than the baby at this point, but it will make a fun addition to her pink nursery. And I got to see and hold her for the first time yesterday! All five pounds of her. She is perfect and precious in every way. We also got her a soft pink linen blanket with ruffles. Again, I can’t resist anything pink for a baby girl! Another of my other favorite baby gifts is a petite chandelier. When my great niece, Josephine was born, I found this vintage brass and crystal chandelier for her nursery. It hung over her crib as an infant and now her clever Momma hung it over her new “big girl bed”. I love how my niece incorporated the chandelier in the brass canopy bed! So pretty and feminine. I gave this fancy little chandelier to my Fairy God-daughter. It wasn’t a baby gift, but rather but a gift to remember her Fairy Godmother by after we moved. Maybe one day she will hang it in her college dorm? By having a chandelier put on a chain and plug makes it super versatile and easy to move.